A second-year teacher is making a big-time impact at Smith Middle School. 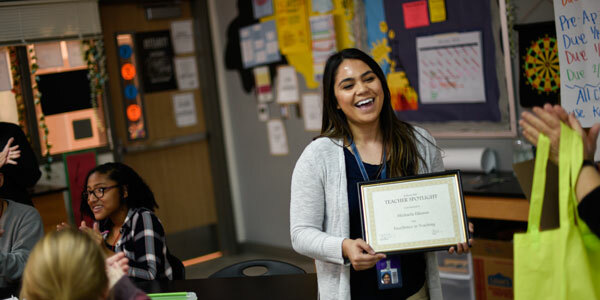 Smith Principal Chad Wolf, joined other school staff members and the KISD spotlight team on a winding path to surprise science teacher Michaela Eikansas. The teacher was moving about the room, getting her students ready for a lab, when the group swarmed in. Busy with what she was doing, it took a few minutes for the focused teacher to realize that a few extra people were in her room. Finally turning around, the teacher smiled uncomfortably, wondering what exactly was going on. The principal explained to all what prompted him to nominate Eikansas for the Teacher Spotlight for the Month. Eikansas was inspired to teach when she saw the impact a teacher could have on a student’s life. “I kind of always knew that I wanted to teach because I had so many positive teaching role models in my life,” she stated. 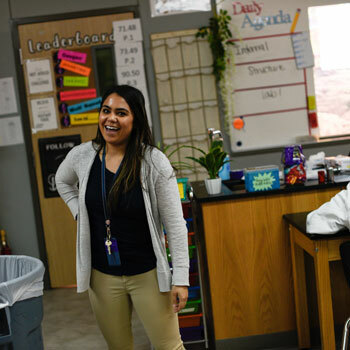 Eikansas teaches at a STEM (Science, Technology, Engineering, and Math) campus and loves seeing her students rise to every academic challenge, but she also wants to help them grow into good citizens. Trying to keep her students engaged with their learning can be challenging at times, but Eikansas has high expectations of herself and her students. Thanking the Smith staff, Eikansas was excited to continue teaching and having an impact on her community.